The Sussex County Clerk’s Office is a passport acceptance agency for the U.S. Department of State. 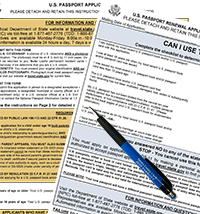 Citizens may apply at the Clerk’s Office in Newton for a United States Passport Book or Passport Card. When applying at our office, please plan on arriving no later than 3:30 p.m. so that ample time is available to process your passport. If you apply in person during our extended office hours (every 1st Monday of the month), plan on arriving no later than 5:30 p.m. Families or groups requiring the processing of three or more passports should allow more time and should call ahead to schedule an appointment to ensure we can accommodate your group. Notes: (1) When taking a passport photo, applicants should not wear white as it interferes with the required white background, nor should uniforms or clothing that resembles a uniform be worn, nor should camouflage attire be worn. Click #PicturePerfectPassport to view a short video about passport photos. (2) Persons applying for a passport book or passport card should take note of “busy” application periods. Early spring is traditionally the busiest time for passport requests, so applicants should plan ahead whenever possible and apply as early as December or January to avoid possible high volume delays.